Married Name: As of before 1801,her married name was MacIsaac. [S107] Family of Dougald MacFarlane, Dove Microfilm, 1801; Reels # 15216 & # 14636. [S237] The McIsaacs - South River, July 30, 1914. Married Name: As of circa 1810,her married name was MacInnis. [S782] JR Reid, Ancestors of Mary Ann Gillis #4141, page 10. [S224] DOF - August 28, 1913, Gillis [Oban], August 28, 1913, page 28. [S1] J. L. MacDougall History of Inveness County, page 403. [S1] J. L. MacDougall History of Inveness County, page 391. [S224] DOF - August 28, 1913, Gillis [Oban], August 28, 1913, page 287 & 28. [S261] Dr. Raymond A. MacLean, History of Antigonish, Volume 1. Natur. Petition*: Florence Ann Cameron petitioned for naturaliztion on 1 March 1954 in United States District Court, Boston, Suffolk, Massachusetts, USA; Petition Granted: Line No. --- of List No. 13673 and Certificate No. 7343296. [S504] National Archives and Records Administration Naturalization Petition, 7190066 (May 11, 1953), Waltham, Middlesex, Massachusetts, USA. [S709] Diocese of Antigonish, Nova Scotia, Canada , Baptismal record of Flora Ann Cameron, page 192. [S441] Florence Ann Cameron, MA Death Registration for # 0097. [S503] National Archives and Records Administration Naturalization Petition (March 1, 1954), Waltham, Middlesex, Massachusetts, USA. [S912] Donald James MacFarlane Border Crossing Card (3 oct 1928), Meredith, Belknap, New Hampshire, USA. [S917] Donald James MacFarlane Border Crossing Card (August 1, 1947), Meredith, Belknap, New Hampshire, USA. [S502] National Archives and Records Administration Naturalization Petition (March 17, 1955), Waltham, Middlesex, Massachusetts, USA. [S470] MA Marriage Registration # 0396 & 0755. Language*: Margaret Anne Cameron spoke English. entered US from CN*: She entered US from CN via CPPR on 20 September 1918 in Vanceboro, Washington, Maine, USA. [S709] Diocese of Antigonish, Nova Scotia, Canada , Baptismal record of Margaret Ann Cameron, page 190. [S530] National Archives and Records Administration Naturalization Petition (August 12, 1941), Waltham, Middlesex, Massachusetts, USA. [S541] Petition for Naturalization McPherson # 0397;. [S916] Donald James MacFarlane Border Crossing Card, 1358056 (Sept 20, 1918), Meredith, Belknap, New Hampshire, USA. Ancestry.com.1940 United States Federal Census[database on-line]. Provo, UT, USA: Ancestry.com Operations, Inc., 2012. Ancestry.com.Massachusetts, Birth Index, 1860-1970[database on-line]. Provo, UT, USA: Ancestry.com Operations, Inc., 2013. Original data:Department of Public Health, Registry of Vital Records and Statistics.Massachusetts Vital Records Index to Births [1916–1970]. Volumes 92–160, 162, 168, 175, 212– 213. Facsimile edition. Boston, MA: New England Historic Genealogical Society, Boston, Massachusetts. Ancestry.com.U.S., Find A Grave Index, 1600s-Current[database on-line]. Provo, UT, USA: Ancestry.com Operations, Inc., 2012. Ancestry.com.U.S., Social Security Applications and Claims Index, 1936-2007[database on-line]. Provo, UT, USA: Ancestry.com Operations, Inc., 2015. Original data:Social Security Applications and Claims, 1936-2007. [S861] Ancestry.com, online www.ancestry.com, British Columbia, Canada, Death Index, 1872-1990. Language*: Agnes Cameron spoke English. Marriage*: She married Dan MacKinnon circa 1940 in Inverness, Nova Scotia, Canada. Married Name: As of circa 1940,her married name was MacKinnon. Death*: Agnes died circa 1971 in Nova Scotia, Canada. [S709] Diocese of Antigonish, Nova Scotia, Canada , Baptismal record of Agnes Cameron, page 191. Language*: Mary Jessie Cameron spoke English. Married Name: As of 1933,her married name was MacPherson. [S430] Obituaries from The Glace Bay Courier Newspaper, Obituary of Mrs. Thomas MacPherson, June 18, 1986. [S733] Allan J. Gillis, "Descendants of Alexander J. Cameron." [S823] St. Mary Cemetery marker, unknown repository, West Lake Ainslie, Inverness, Nova Scotia, Canada. [S823] St. Mary Cemetery marker, unknown repository, West Lake Ainslie, Inverness, Nova Scotia, Canada, Alexander Cameron, his wife Catherine and their sons Alexander Dan & Daniel, daughter Annie Bell. [S709] Diocese of Antigonish, Nova Scotia, Canada , Baptismal record of Daniel Cameron, page 191. Name-Comm: His common name was Captain Sandy. [S862] Alexander MacDonald, Alexander McDonald Death Registration # 0106. [S31] Catherine Cameron # 43, Catherine Cameron, Death Certificate. Language*: Angus D. Cameron spoke English. Biography*: Angus was going to school in 1871. In 1881 he was a carpenter. The 1891 Census states that he could both read and write. [S170] 1881 Canada Federal Census, 101 Newbury Street, Boston, Suffolk, Massachusetts, USA. [S206] Genealogy of the Walker Family of Lake Ainslie, Agnes Walker, typescript, 1990 Donald James MacFarlane, page 59. [S823] St. Mary Cemetery marker, unknown repository, West Lake Ainslie, Inverness, Nova Scotia, Canada, Angus D. Cameron. Language*: John D. Cameron spoke English. [S823] St. Mary Cemetery marker, unknown repository, West Lake Ainslie, Inverness, Nova Scotia, Canada, Marker for family of Donald Cameron. Language*: Archibald Cameron spoke English. [S823] St. Mary Cemetery marker, unknown repository, West Lake Ainslie, Inverness, Nova Scotia, Canada, Marker for family of Donald Cameron & Flora Walker. Death*: Margaret died after 1 February 1943. Biography*: The 1891 Census states that Margaret was living with her brother Alex, she could both read and write. The 1901 Census states Margaret was living back with her parents. Religion*: Flora Cameron was Roman Catholic. Married Name: As of 4 December 1912,her married name was Boyle. [S709] Diocese of Antigonish, Nova Scotia, Canada , Baptismal record of Flora Cameron, page 254. Religion*: Mary Cameron was Roman Catholic. Married Name: As of 9 November 1904,her married name was Augerton. Death*: Mary died after 1 February 1943. [S709] Diocese of Antigonish, Nova Scotia, Canada , Baptismal record of Mary Cameron, page 268. Language*: Isabella Cameron spoke English. Name-Comm: Her common name was Bella. Married Name: As of 3 April 1900,her married name was Ormond. Death*: Isabella died after 1 February 1943. [S709] Diocese of Antigonish, Nova Scotia, Canada , Baptismal record of Isabella Cameron, page 266. [S206] Genealogy of the Walker Family of Lake Ainslie, Agnes Walker, typescript, 1990 Donald James MacFarlane, pag, 57. [S427] CBGHA, online www.cbgha.org, December, 2005. 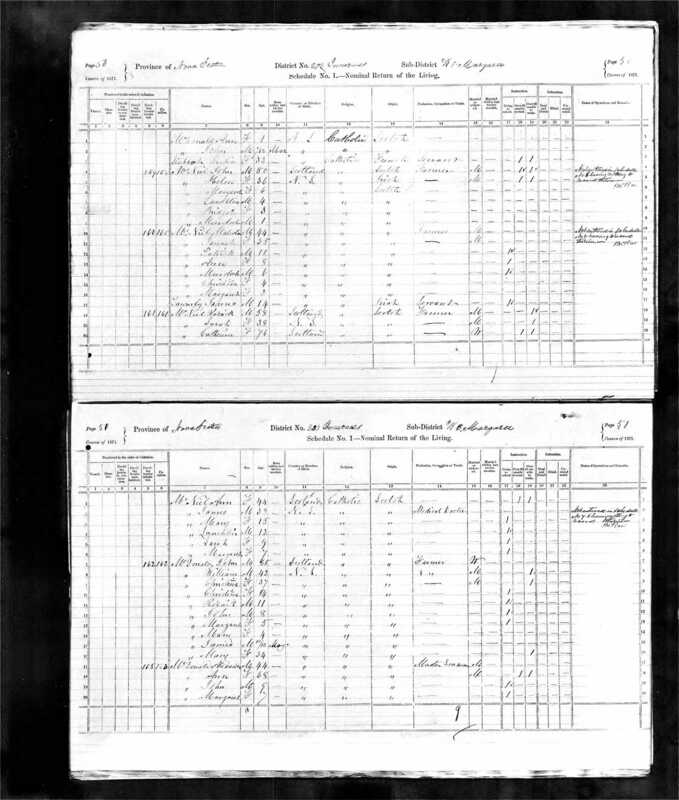 Extracts from the 1838-1841 Federal Census of Cape Breton, Microfilm #M5220, National Archives of Canada, Ottawa. Name-Comm: His common name was Old Angus. [S16] A. D. MacDonald, Mabou Pioneers, Volume I, page 95. 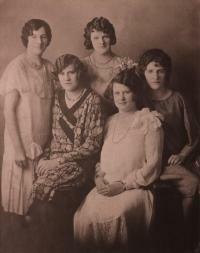 [S755] Unknown author, "Descendants of Donald Beaton ID# 0126", page 1. Birth*: Isabel was born in 1750 in Keppoch, Inverness-shire, Scotland. Married Name: As of 1780,her married name was Beaton. Birth*: Angus was born in 1750 in Scotland.